Bowron Lake Provincial Park canoe circuit in British Columbia, Canada, is world famous. 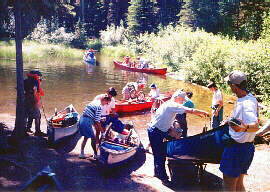 People from all walks of life, from different countries, speaking different languages have canoed the Bowron Lake Chain. In 1926, thanks to the work done by Frank Kibbee and Thomas and Eleanor McCabe, the BC provincial government classified this area as a game reserve. In 1961 it was reclassified as a park and named after John Bowron, a gold rush pioneer who became the Gold Commissioner at Barkerville, now BC's famous restored gold rush town of the 1860's. Bowron Lake Provincial Park is located in the Cariboo Mountains on central BC, and Wells on Hwy 26 is the nearest community. Take Hwy 26 from Quesnel to Wells, a distance of 90km (55.8mi) and it is 30 km (18.6mi) by secondary road to the park from Wells. The popularity of the Bowron Lake Canoe Circuit means that a reservation system is in place. Groups of six or more must reserve, for smaller groups its highly recommended or you could end up waiting, as only 50 people/25 canoes are allowed on the circuit daily. You must be fully equipped and completely self sufficient. Remember what you take in, you must take out. If inexperienced, do some practicing and conditioning before you venture on the circuit. Be water wise and observe proper safety procedures. Be cautious when approaching any wild animals, bears can be very unpredictable, and moose have been known to charge if you get too close. The circuit is open to canoers between June and the end of October, July and August are usually very busy, and weekends are heavy departure times. Bowron Lake Provincial Park is a BC wilderness park covering more than 121,600 hectares (300,352 acres) of land with a system of six major lakes. Making up the canoe circuit are Indianpoint, Isaac, Lanezi, Sandy, Spectacle and Bowron Lakes, the Cariboo and Bowron Rivers, other smaller lakes and streams and several portages. 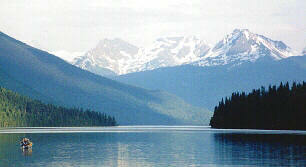 Forming a backdrop are the rugged and majestic Cariboo Mountains. The canoe circuit is 116km (72mi) and paddlers can do the route at their own preferred speed. Ideally the circuit can be completed in six or seven days, but if you plan to do some fishing or just plain relaxing in the serene surroundings, you can take longer. And it is possible to be storm bound for several days. There is a shorter and less strenuous canoe trip available, its known as the West Side Trip, and takes you from Bowron Lake to Unna Lake. Your canoeing journey begins at the Registration Centre, and you travel with the water flow, going clockwise. The hardest part of the trip is at the beginning, with a 2.4km (1.4mi) portage from the Registration Centre to Kibbee Creek. The creek takes you out to Kibbee Lake which is only 2.4km (1.4mi) across, then another portage of 2km (1.2mi) to Indianpoint Lake, which is 6.4km (3.9mi) across. As you near the east lake of Indianpoint Lake, the lake turns marshy, but a marked channel leads to a slough and the portage trail at its head. From this point its easy going to Isaac Lake The West Arm of Isaac Lake is 6.8km (4.2mi) long and the Main Arm is 31.2km (19.3mi) long. When canoeing Isaac Lake, paddle close to shore, as high winds and rough water may occur at any time. This section of your trip is both a Portage and canoeing the Isaac River. Isaac Lake to McLeary Lake is 2.8km (1.7mi) of which about 1.6km (.9mi) can be canoed. Once you arrive at McLeary Lake, take the hiking trail up on either side of the Isaac River to the falls. Here the river flows 11 Metres (36 feet) over a ledge, to form this natural site. McLeary Lake is only 1.2 km (.7mi) across, next is the Cariboo River. Be prepared at all times while on the Cariboo River, as its swift and has sweepers (tree trunks extending out from the bank into the current). 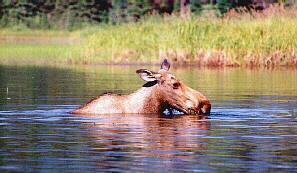 This part of your trip, the Cariboo River, McLeary Lake to Lanezi Lake is 5.2km (3.2mi) long. When canoeing Lanezi Lake which is 14.8km (9.1mi) , the inside perimeter is the route most take and there are few places to land along the shore. The Cariboo River, from Lanezi Lake to Sandy Lake is a short canoe trip of 1.2km (.7mi) and to canoe across Sandy Lake is only 4.8km(2.9mi). As you follow the Cariboo River, Sandy Lake to Babcock Creek its a distance of 3.6km (2.2mi). Just before you get to Babcock Creek, watch for the narrow entrance to Unna Lake. Do not proceed down river past this point, instead walk along the trail to the viewpoint and see the 24 metre high (78.7ft) Cariboo Falls. Unna Lake is a great place to stop and relax, enjoy the crystal clear water and sandy shores. Babcock Creek is too shallow for paddling, so its best to walk the mid-channel, lining the canoe. Babcock Lake is only 2.8km (1.7mi) across, and between Babcock Lake and Spectacle Lakes the two portages are short and easy. Spectacle Lake including Swan Lake is a 12.4km (7.6mi) trip, and its easy going from here on. Canoeing the Bowron River, from Spectacle/Swan Lake is an easy 4km (2.2mi) trip and Bowron Lake is 7.2km (4.4mi). Afternoon wind squalls are quite regular on Bowron Lake, so its best to canoe the east side of the lake. No camping areas are available along the shore of Bowron Lake, so, the end of the circuit landing point is a plainly visible float at the Bowron Lake Campground. This is the shorter and less strenuous trip. It means you will be going counter-clockwise and starting your canoe trip at Bowron Lake. 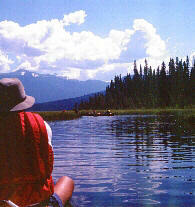 From Bowron Lake, you canoe the slow, meandering Bowron River to Spectacle Lakes. There are two short and easy portages between Spectacle Lakes and Babcock Lake. Babcock Creek is shallow, its suggsted to walk mid-channel, lining the canoe. Unna Lake is as far as you can go on this canoe trip. From Unna Lake, you can walk to the viewpoint to Cariboo Falls. Unna is a small clear lake with a sandy shoreline. Its a great place to camp and spend some quiet time. This is a much shorter trip than the complete canoe circuit, but again you can take your time. It can take anywhere from six to seven days, or longer. You must reserve and register this West Side Trip. The same rules and regulations apply to this short trip as they do in the complete canoe circuit. For canoes, equipment rentals and accommodations, there are two privately owned lodges on the northwest shore of Bowron Lake. Visit the BC Parks website.